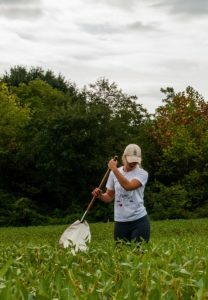 The Walgenbach Entomology Lab is located at the Mountain Horticultural Crops Research and Extension Center (MHCREC) in Mills River, NC, which is approximately 260 miles west of the main NC State University campus in Raleigh. Our overall mission is to conduct an applied research and extension program in the area of Integrated Pest Management on tree fruits and vegetables. The program is coordinated by Dr. Jim Walgenbach and includes a full-time technician (Steve Schoof), several research assistants and graduate students, and undergraduate summer assistants. The research and extension programs are focused on arthropod pests of apples, peaches, tomatoes, peppers, and cucurbits. 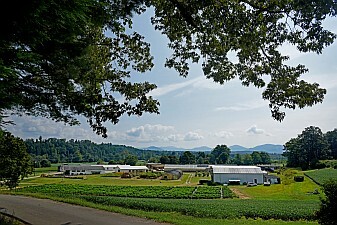 Field research is conducted at the Mountain Horticultural Crops Research Station (MHCRS) in Mills River, the Mountain Research Station in Waynesville, and on commercial farms throughout the mountain and piedmont regions. Our laboratory maintains colonies of several different insects and mites, including predatory mites and hymenopteran parasitoids, for year-round toxicological and behavioral studies.